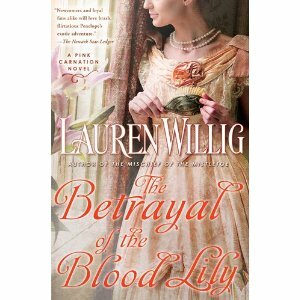 The Betrayal of the Blood Lily is the sixth novel in Lauren Willig’s Pink Carnation series. Like the other books in the series, this one features a blend of espionage and romance and is framed by the story of Eloise Kelly, an American graduate student in England working on her dissertation, a treatise on aristocratic spies during the Napoleonic wars. In book 6, the romance between Eloise and Colin Selwick, self-proclaimed novelist and maybe spy, has progressed, but the heart of the novel is the historical tale, the story of Penelope Deveraux, a secondary character in The Masque of the Black Tulip and The Temptation of the Night Jasmine. Penelope delights in breaking rules and setting the gossips of London society abuzz until she finally goes too far. Caught in a compromising position with Lord Frederick Staines, she finds herself “ruined in January, married in February, on a boat to the tropics by March.” Her husband is appointed Special Envoy to the Court of Hyderabad, and Penelope is expected to play the role of Lady Staines, little more than an appendage to her husband. The physical attraction that brought Penelope and Freddy together is a poor foundation for a marriage between two people who share no common interests or values. Freddy spends his time drinking, gambling, and consorting with the Indian mistress he has installed in the home he shares with Penelope. Penelope, who finds she is married to a man she doesn’t even like, keeps busy confounding the expectations of Captain Alex Reid, a controlled, disciplined soldier who escorts the Staines to Hyderbrand. The story is filled with political intrigue, rumors concerning the mysterious spy Marigold, and dangers in unexpected places. Alex, against his own judgment and at considerable risk to his honor, accepts Pen’s help to find the spy and protect British interests in India. Blood Lily possesses the skillful characterization and historical detail for which Willig is known, and it boasts a more exotic setting than the other books as well as major twists to some established conventions. While India has become more common as a setting for historical romance in recent years, it is still rare enough to be refreshing to readers looking for a change from London ballrooms and English estates. Forced marriages are a staple in romance fiction. Typically the marriage leads to the predictable HEA, but Willig inverts the trope here. Penelope’s forced marriage leads to misery. Penelope is not a typical heroine in any sense. She is thoughtless, manipulative, and prone to bouts of self-pity, but she’s also courageous, intelligent, and vulnerable. In other words, she is human with her fair share of weaknesses and strengths. Alex is a more conventional character, but his loyalty to his motley family and the conflicts he suffers save him from being merely typical. More turning convention on its head occurs with the adulterous relationship between Pen and Alex. Willig doesn’t gloss over the adultery. Although Freddy is a faithless spouse, Pen’s adultery, should it be discovered, would be viewed quite differently. Additionally, both Pen and Alex have their own guilt with which to contend. Meanwhile, in the contemporary world, Eloise is trying her hand at matchmaking and feeling insecure after a near-quarrel with Colin. But it’s Valentine’s Day, and they have a date, complete with a rose, pink champagne, and revelations about the modern-day Selwicks. Some readers may find Willig’s unconventional choices too much, but for readers who like flawed characters, value great dialogue, enjoy mystery with their history, and appreciate memorable prose, this novel will be a great addition to the TBR stack. If you’ve never read any of the Pink Carnation books, this one works well as a stand-alone book. I’m betting that if you read this one, you’ll look for the backlist. I’m reading The Mischief of the Mistletoe (October 2010) now and looking forward to The Orchid Affair (January 2011). I also have high hopes that we will see more of Alex’s fascinating family in future books. This is a really good review and now this series intrigues me. I have only just heard about Lauren'books she was kind enough to donate some for the silent auction we are having at ARRC2011 to raise funds for the Queensland flood victims and the donations are arriving here at my place and they look really good. Thanks Janga I really need to add these to the must have list. I truly love this genre and time period in history. Knowing that the author has had to do an enormous amount of historical research in addition to creating a storyline is amazing. I look forward to reading this novel. I have read the first Pink Carnation book, but have not had the opportunity to read the rest of the series. But I did enjoy the spy and intrigue aspects of the book. Also, I think it's an interesting technique to have a contemporary story that flows through all the books in the series as a frame for the historical story. It's a great way to tie them all together. Terrific review, Janga. I've heard so much good buzz about this series. One of these days....! Thanks for another terrific review, Janga. I hadn't heard of this series before but it certainly sounds intriguing. ::Sigh:: I'm hoping to sell my house and downsize but, at the rate I'm buying books, I'll have to look for something bigger! LOL! Helen, what a wonderful idea to hold a silent auction to raise money for the flood victims. I hope you're wildly successful! Connie, I hope you enjoy the book. Thanks for stopping by today! I think it's an interesting technique to have a contemporary story that flows through all the books in the series as a frame for the historical story. I agree, Lisa. That sounds very interesting. Loucinda McGary used that technique in her single-title The Treasures of Venice and I enjoyed it immensely. Nice cover, sounds really good. Great review, Janga! I love when a historical novel is set somewhere other than the norm. I am so intrigued by the review of this book that it makes me want to hunt it down and read it NOW! It sounds intriguing although I have not read any of the other books in the series.